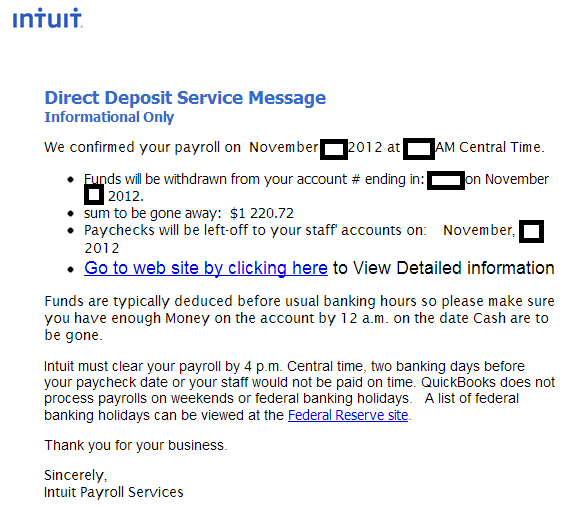 Cybercriminals have resumed spamvertising the Intuit Direct Deposit Service Informer themed malicious emails, which we intercepted and profiled earlier this month. While using an identical email template, the cybercriminals behind the campaign have introduced new client-side exploits serving domains, which ultimately lead to the latest version of the Black Hole Exploit Kit. We’ve already seen these name servers in related and recently launched campaigns by the same cybercriminal/gang of cybercriminals – “‘Payroll Account Holded by Intuit’ themed emails lead to Black Hole Exploit Kit“; “‘Your Discover Card Services Blockaded’ themed emails serve client-side exploits and malware“. Upon successful client-side exploitation, the campaign drops MD5: 896bae2880071c3a63d659a157d5c16f – detected by 33 out of 44 antivirus scanners as Worm:Win32/Cridex.E. Upon execution, the sample phones back to hxxp://203.172.238.18:8080/DPNilBA/ue1elBAAAA/tlSHAAAAA/ (AS23974, Ministry of Education, Thailand). The following domain has also responded to this IP in the past: phnomrung.com (Name server: ns1.banbu.ac.th – currently responding to 208.91.197.101). We only managed to reproduce performingandroidtoios.info‘s malicious activity. Upon successful client-side exploitation, it drops MD5: fa762aba0abc5ed38a179fcaa6597033 – detected by 24 out of 44 antivirus scanners as PWS:Win32/Zbot.